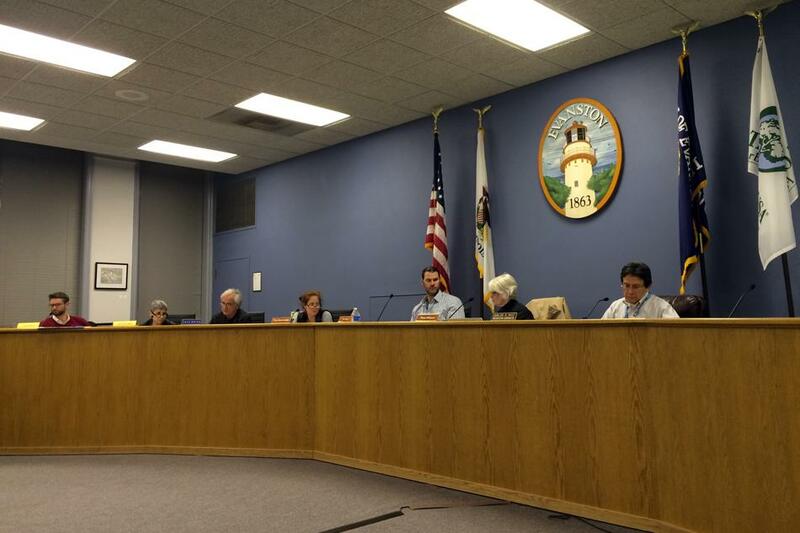 Evanston Preservation Commission members, along with the city’s preservation coordinator Carlos Ruiz, deliberate Northwestern’s proposal to rezone the campus. Their changes to the proposal included dividing NU into five zones as opposed to its current two, as well as requesting the ability to review proposals for major projects within 250 feet east of Sheridan Road. Members from the Evanston Preservation Commission passed a motion at a special committee meeting Thursday night to redivide Northwestern’s campus into five lots. The proposal now goes back to the University for review. NU’s campus east of Sheridan Road is currently divided into two zones: one historic zone to the west that contains all 12 of the landmark structures on campus — including Lunt Hall, Annie May Swift Hall and Deering Library — and one eastern zone that encompasses the Lakefill. The first zone, however, contains an additional 46 buildings that are not landmarks, but because they sit inside the historic zone, NU must gain approval from the Preservation Commission on building renovations or projects in the zone. In February, NU proposed new subdivisions that would split the western zone into five smaller divisions that would encompass the 12 landmark buildings. Carlos Ruiz, the city’s preservation coordinator, spurred discussion by presenting the city’s recommendation that the committee accept NU’s proposal with two additional conditions. The first was that two of the lots, which together cover the area between the Technological Institute and the Donald P. Jacobs Center be combined to make one larger lot. The second was that NU seek feedback from the commission on any major project proposed to be built within 250 feet east of Sheridan Road. The committee largely agreed on the conditions, aside from the vice chair Jack Weiss, who thought 250 feet was too small an area. Weiss later presented a motion that allowed for the 250 feet limitation, but requested that the committee’s suggestions be binding instead of simply advisory. Weiss added that the committee’s recommendations should be incorporated into a process by the city’s Design and Project Review Committee, which would then work with the Preservation Commission and NU to reach a cohesive decision. Instead of NU gaining approval from the Preservation Commission to build in the historic zone first — which is the current process — the university would now be able to go directly through DAPR. If the commission had any problems, they would be addressed in DAPR’s report before construction was allowed to begin. “Conceptually speaking, if there were issues raised by the Preservation Commission that were then submitted to DAPR and DAPR felt that those comments were not satisfied by the University or anyone else, then we could hold the permit until we felt that those comments were addressed,” explained Mark Muenzer, the city’s director of community development. The final motion, which called for the creation of five lots and binding review of projects within the 250-foot border, passed with a 4-2 vote.